The Gemini constellation, one of 88 defined by the Astronomical Union, is a group of stars and galaxies that are visible in both the northern and southern hemispheres during autumn and winter. The Gemini constellation is made up of two long spurs joined at one end by the stars Castor and Pollux, and at their other ends splitting again into four shorter spurs. There are four main stars within the constellation that are visible to the naked eye, Castor, Pollux, Alhena, and Wasat. The name of the Gemini constellation is Greek in origin, although other cultures of the near east and further afield in the Indian subcontinent also identified the stars forming Gemini as a constellation under names and symbols that were different yet similar. It cannot be said that the ancient Greeks were any more knowledgeable of the stars and their positions, all that can really be said with confidence is that in modern times we continue to use Greek names for the constellations. As long ago as 6000 years ago the Indian historical and religious text, the Rigveda, mentions the two primary stars of the Gemini constellation as being the twin horseman who appeared at dawn, part of the Ashvins, they were known as Nakula and Sahadeva. Around that time the two stars would have been visible only at dawn during spring, leading to the idea of them being twins and associated with the spring equinox. The twin horseman corresponded to the two stars we know as Castor and Pollux and the Sanskrit name Mithuna which means the twins correspond almost exactly to the modern Gemini constellation. From India the constellations spread westwards to the ancient near east civilizations and by 5000 years ago ancient Babylonian people had adopted the constellations for their own astronomy which they also used to track the seasons and for navigation. To the ancient Babylonians Gemini was known as Mastabba Galgal, which we believe translates as the great twins, heroes whose names were Gilgamesh and Enkidu, and who battled the gods in a series of epic adventures on his quest for immortality. Ancient Egyptians also adopted the twin stars as an important part of their astronomy, and using two goats to symbolize the two stars which were mentioned in the Ramissede Hour Tables, a method of determining the time at any point during the night by knowing which stars followed each other. The two stars of the Gemini constellation were known to rise at dawn. 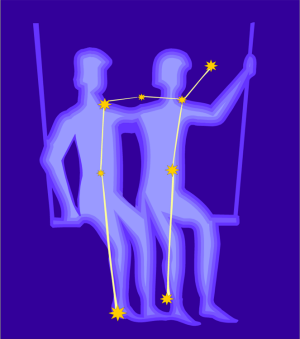 By the 1st millennium BC ancient Greek society was in its ascendency but many of the ideas advanced by Greek astronomers were not unique, the history of the Gemini constellation amongst them. Most of the Greek constellations came directly from Babylonian astronomy, though the legends surrounding the origin of the constellations were taken from Greek mythology. 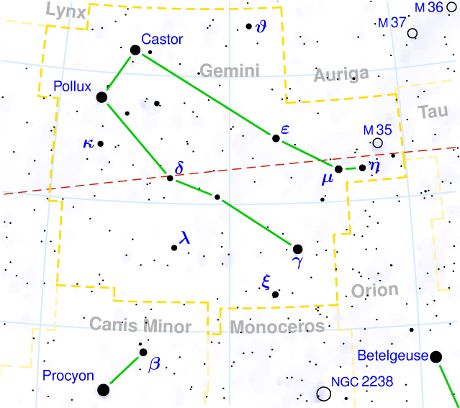 The Gemini constellation in particular was believed to be the immortal twins Castor and Polydeuces. Castor and Polydeuces (known as Pollux in Roman times) were twin boys born to Queen Leda of Sparta. who was married to King Tyndareus. The Greeks believed that Castor and Polydeuces were conceived on the same night along with their two sisters Helen and Clytaemnestra. Castor and Clytaemnestra were the offspring of Tyndareus an were mortal, whilst Polydeuces and Helen were the offspring of Zeus and therefore immortal tho not gods. Despite different fathers, the twins Castor and Polydeuces were inseparable. Castor and Polydeuces had many adventures together where there different talents would be tested, Castor with horsemanship and archery, and Polydeuces with his strength and boxing skills. The twins became famous throughout known world when they joined Jason on his quest to find the Golden Fleece. The real story of how they came to form the Gemini constellation relates however to the tragedy of their love for two women who were already promised to other men. Phoebe and Hilaeira were the daughters of Leucippus, an uncle of Castor and Polydeuces who had an agreement with Aphareus of that his sons Lynceus and Idas would marry the daughters. Legend doesn’t tell if Aphareus’s daughters were in love with Castor and Polydeuces but in any event they found themselves in Sparta, married to Castor and Polydeuces and giving birth to sons. Of course in all great Greek tragedies the hapless sons of Aphareus could not let this slight go unchallenged. Idas ambushed Castor on his return from a cattle raid and killed him with his spear, but was then felled by a thunderbolt hurled by Zeus in anger at Castors death. Lynceus was killed in a fit of rage by the immortal Polydeuces who then pleaded with his father Zeus to let Castor live. Zeus gave Polydeuces a choice, return to Olympus or share his immortality with Castor between Hades and Olympus. The Gemini constellation is the embodiment of Castor and Polydeuces in the heavens. The brightest star in the Gemini constellation is Pollux, known in astronomical terms as beta Geminorum. In 1993 it was announced that Pollux, which is a little over 33 light years from our solar system, has an extrasolar planet that is believed to be about 2.3 times the size of Jupiter and takes 590 days to orbit Pollux. By 2006 astronomers were also anticipating that further advances in telescopes and the hunt for earth sized planets will likely confirm a rocky water covered planet further away from the star and outside the habitable zone. Castor also known as alpha Geminorum, is located around 51.6 light years away is a unique star in that it is actually made up of 6 stars that are in close gravitational union. In 1678 Giovanni Domenico Cassini first discovered that Castor is a visual binary star but the truth of this enigma wasn’t known until the the 20th century when spectroscopy advancements allowed astronomers to identify each star as a binary. These two sets of binary stars orbit each other fairly close together taking 350 years to do so, whilst a third binary system orbits the four main stars from a slightly greater distance yet taking 10,000 years to complete. 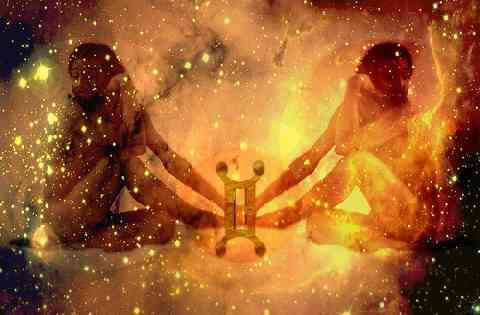 Check out the complete history of the zodiac signs.